Perhaps the best known native honey-eater in Eastern Australia inhabiting disturbed forest edges and urban gardens which retain a Eucalyptus canopy from southern Tasmania up to the Atherton Tablelands in far north Queensland. They don’t venture far past the western side of the Great Dividing Range leaving that to their relatives the Yellow-throated Miner. Both male and female look the same with upper parts a motley grey and wings slightly darker grey with yellow flecks and the under parts are whitish. 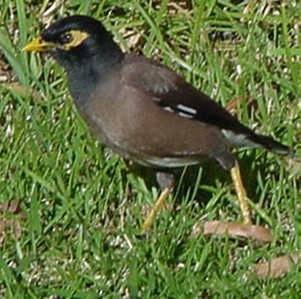 They have a bright yellow triangular patch just behind their brown eye and their beak and legs are also yellow. A communal song of a 2-3 syllable teu-teu-teu to establish their territory can be heard just before sunrise and they will continue to sing, chirp, whistle and chatter through the day as they forage mainly amongst up in bushes and trees through bark and leaves for insects, beetles, ants, wasps, bees, weevils and caterpillars occasionally dropping on to the ground. 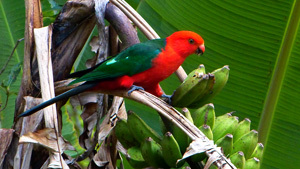 They are also nectar and fruit eaters and delight in harvesting from many flowering and fruiting trees and shrubs. Their breeding season is from June-December, where up to 20 metres high in a tree and on her own, the female builds a cup like nest of twigs and grasses softy lined with moths cocoons or wool and bound with animal hair and cobwebs. She lays 2-4 eggs a day apart for staggered hatching and incubates them for 15-16 days. When the chicks have emerged from the egg up to 10 males will come and join in their feeding exceeding up to 50 times an hour. The nestlings take about 16 days to leave the nest and several broods may be laid in one season. Originally introduced by humans into Melbourne from Southeast Asia back in 1862 they quickly established themselves. In 1883 they were taken up to Northern Queensland, ostensibly to combat insects in the cane fields! 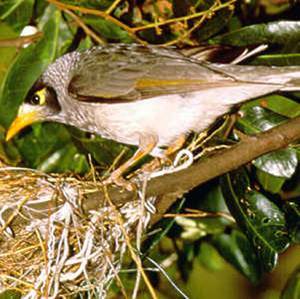 A feral bird and now also a serious pest they are found in most cities and towns along the east coast of Australia in some areas in plague proportions. Their natural range is Turkestan to India, Andamans and Sri Lanka. Keep palms well trimmed. 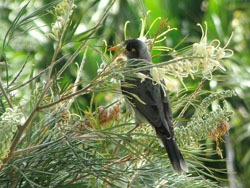 Avoid planting exotic species such as Cocos Palm, Slash Pine, Radiata Pine and Umbrella Tree as these are preferred Indian Mynah roosting trees.